This has been a pretty eventful year for Andrea Keller. In the past few months the magnificent pianist (is it too soon to call her a ‘national jazz treasure’?) not only released three albums (two featuring new material, the other a compilation) but she also bid farewell to two of her long-standing bands (one by choice, the other due to the devastating demise of Allan Browne), following this with the creation of five (!) new bands – all five exploring the boundaries and possibilities of the trio formation, all five named “Transients“, with a distinctive number indicating each one’s line-up. After an initial run in several venues, now the band(s) are getting a residency, “Transient Tuesdays” at Bennetts Lane Jazz Club, much to the excitement of the leader, who shares the backstory of this chain of events. AustralianJazz.net How did you come up with the idea for the Transients? 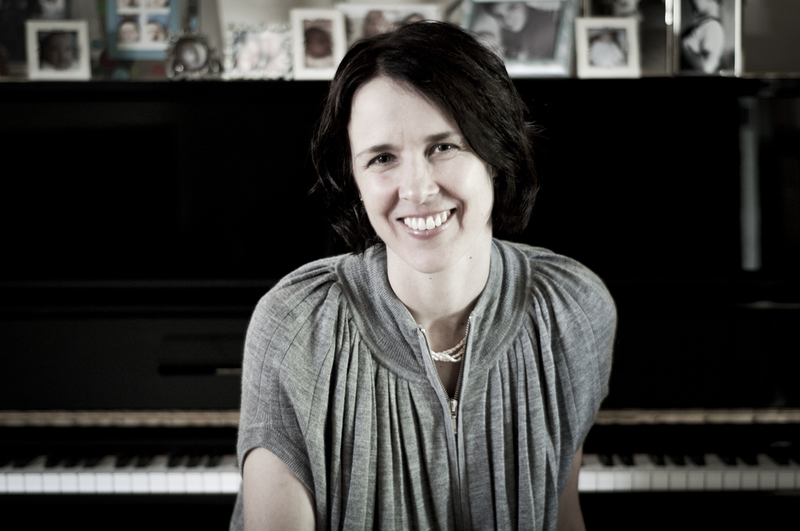 Andrea Keller: My main trio playing experience was with Allan Browne. I started playing in trio with Al and Nick Haywood in 2000, and then Keller/Murphy/Browne was formed in 2003 with Tamara Murphy on double bass. KMB played regularly from December 2003 until Al’s death in June 2015. After Al passed away, I knew I would miss him terribly, miss playing with KMB and playing in trio. Sonny Rehe asked me what my plan was, regarding trio playing and offered me a handful of gigs at Uptown. My plan was to book a few different trio line-ups and see which one appealed to me most. It immediately became apparent that all the line-ups I chose were enormously appealing to me, and I wanted to develop all of them! So I titled the series ‘Transients’ to reflect the changing line ups and took it from there. AJN: How did you decide on each formation? AK: I approached musicians I wanted to start playing with more, and followed Al’s lead in approaching those from different generations and at varying points in their careers. The idea was to foster a collaborative approach to the music making and invite the other musicians to contribute their compositions and favourite tunes as well, rather than me having complete control over the repertoire (as was the case in the Andrea Keller Quartet). By opening things up like this, there’s diversity to the music that otherwise wouldn’t exist to the same degree. The groups collectively begin to define their own sound and direction. Two of the trios are piano/ bass/ drums – one being Ben Robertson on double bass and the other Christopher Hale on 6-string bass guitar; the choice of instruments and individuals makes an enormous difference to the sound and character of the music. Two of the trios are piano/ double bass/ horn – one being Eugene Ball on trumpet and the other Julien Wilson on tenor saxophone and bass clarinet. All members of these trios contribute heavily to the repertoire so the sound is very varied. The last trio is a bass-less line up with piano/ guitar/ drums, which undeniably has it’s own sound, not just because it’s bass-less, but also because Stephen Magnusson is at the helm! AJN: How have the Transient concerts been so far? AK: The concerts have been rewarding and challenging. We’re tackling repertoire that we’re not totally familiar with, we haven’t had years of playing together under our belts, yet I decided to have all the gigs recorded (in order to get a promo pack together for the project). Despite these pressures, it’s been incredibly exciting to get glimpses of where the trios are heading; each is already displaying distinctive characteristics and a unique aesthetic, which is what one would hope for in this type of music. A highlight was having audiences attend more than one concert, and then give me reports on what they liked about the different trios, and which were their favourites. Presenting the series also gave Megan Evans the idea to turn Tuesday nights at Bennetts Lane into ‘Transient Tuesdays’, which is a dream for any bandleader! Having a regular place to play and develop the music, with a great piano, beautiful sounding room, and a listening audience is so hard to find, but sorely needed by musicians. AJN: You mentioned Allan Browne as a source of inspiration; how do ‘Transients’ honour his legacy? AK: I learnt so many valuable lessons from Allan Browne over the years, both musically and personally. He was an incredibly important figure in my life and development. His philosophy of a collective approach to music making, creating a dialogue between the musicians and striving for meaningful connections over virtuosity, are the main ones I carry with me. I started playing with Al when I was relatively young and inexperienced. Through his response to my playing, his enthusiasm and encouragement, he validated for me my contribution and taught me that the possibilities within the music were boundless. I suppose it’s these things that are at the heart of’ ‘Transients’. AJN: How do ‘Transients’ follow up on Keller/ Murphy/ Brown’s last outing, ‘Travellers‘? AK: When Tamara and I launched ‘Travellers’ at the Melbourne Women’s International Jazz Festival in December 2015, we invited Eugene Ball to join us in trio, because the thought of sharing the music with another drummer seemed impossible. Eugene has an extensive history of working with Allan, as well as Tam and I, so the grouping was ideal for the situation, and has now become ‘Transients IV’, a trio in its own right. AJN: What is your favourite track of ‘Travellers’? AK: I don’t listen to recordings I’ve played on, except to make sure the playing is acceptable enough to be released into the world, and to check the mix/master. But ‘Empty Garden’ comes to mind as my choice, simply because it includes Al’s reading of Beverley George’s poems of the same name. The words from Al’s voice were recorded only a matter of weeks before his passing, so the track has become especially poignant. AJN: Why did you decide to dismantle your Quartet? AK: The dismantling of the AKQ occurred after I’d already begun ‘Transients’, and wasn’t something I anticipated doing. However, when Joe Talia (the band’s drummer) announced he was relocating to Japan, I was forced to reassess the possibilities and future of the group; whether I replace Joe, we become a barely gigging band, or I finish the project altogether. Considering the energy, time and money it takes to run a band (keep it working, write music for it, continue documenting/recording it etc. ), and the fact that I’d essentially just started five new bands in ‘Transients’ (! ), I opted to put my full energies into the latter and acknowledge that 17 years was a really great effort from all involved in the AKQ, but the time had come to switch focus. I’m incredibly proud of the AKQ and all it achieved, so I chose to celebrate it through a final hoorah, rather than let it dwindle and fade into oblivion. One of the unexpected highlights of ‘Transients’ is that it’s given me an opportunity to dig back into all the repertoire I’ve written (for the AKQ, Three Lanes and KMB), the pieces I’d long since forgotten, and reinvent them with a new group of musicians. The tunes, their harmonies, arrangements, have in many cases been totally re-imagined. There was also a brand new set of repertoire I’d penned for the AKQ just before it dismantled, which hadn’t yet been developed, so all of this has carried forward into ‘Transients’. AJN: What part of working with the Quartet are you going to miss the most? AK: After 17 years of playing and touring with Ian and Eugene, and 11 years with Joe, the relationship goes beyond just the music. I don’t have sufficient words to explain it. We used to say that when we did a gig together, it felt like putting on an old pair of sneakers. Perhaps those words explain it best.